Once again procurement issues are in the news. With the release of the Auditor Generals report the theme of most of the reporting appears to be that the Fixed Wing Search and Rescue program is off the rails, something knowledgeable observers have been saying for some time. Parallels have been drawn between the F-35 debacle and the search for a FWSAR candidate. The general argument (widely repeated until it becomes self sustaining) is that, just as the Department of National Defence chose the F-35 for the next generation fighter with no thought of alternatives, so the FWSAR requirement was written around the C-27, which caused the current mess. The idea of picking a preferred choice out of the catalog and then pursuing it to the exclusion of all others often seems like an attractive option. It is assumed that by moving straight to the purchase phase one can forgo the time and money consuming steps dictated by the normal procurement process without, it is hoped, incurring any penalties. When this method works, as in the purchases of the C-17, the C-130J and the M777 howitzer the results appear to vindicate the theory. It is informative to note that in all these cases the purchases were almost literally off the shelf. They were purchased from existing production lines with almost no attempt to modify the purchases to meet Canadian requirements. As well, given the nature of the purchases, the fact that they were established products with established markets, the price range was already established making it easier to calculate costs. The technique of direct purchasing fails when, as in the case of the CH-47 Chinook helicopter program, there is an attempt to make modifications to an existing design. The results in this program have been price increases, time delays, and fewer aircraft being acquired. In the case of the F-35 it is widely believed that the fault lies in deciding on an aircraft which was in its development stage. Much like the CH-148 Cyclone maritime helicopters, another badly flawed program, this is technology in its early stages. It would appear that the trick to making this procurement technique work is to buy mature technology off of an existing production line. How does this apply to the FWSAR program? The government, according to the Auditor General, needs to do something now to avoid endangering an already threadbare Search and Rescue system. Specifically, they need to buy fixed wing aircraft. The stage is set for the competitive process known as an Advance Contract Award Notice (ACAN). The ACAN process permits the Government to identify an intended contract award winner based on the mandatory capabilities and detailed market research conducted by the Department. In theory industry is then given the opportunity to respond, should they feel they have an aircraft that meets this criteria. If no supplier submits a statement of capabilities that meets the requirements set out in the ACAN during its posting period of 30 calendar days, then the competitive requirements of the government’s contracting policy have been met and the government’s choice is bought. The aircraft the Government needs to buy is a variant of the Bombardier Dash 8-400 modified to act as a search and rescue aircraft. The Canadian Armed Forces already have one Dash-8 in service, as a navigation trainer, and they would have no problem taking more of them into inventory. When considering the purchase of Dash-8s’ it is necessary to deal with the whole rear aircraft ramp issue. Although widely used for search and rescue or maritime patrol in other countries the Dash-8 has not been considered for the purpose in Canada because it lacks a rear opening cargo door. After botching the procurement program the DND was forced to commission a report on the issue written by the National Research Council. They have been leaning on it, at least the parts they like, ever since. In that report the NRC mandated a rear opening cargo door. They believed that it was a safety issue for the rescue techs who had to parachute into crash sites. As well, it was considered to be easier to maneuver stretchers into an aircraft with a large rear opening door. In truth, the NRC report was based on existing aircraft with no special modifications for side exits by parachutists. No attempt was ever made to examine the air operable doors provided by Field Aviation to most operators of Dash-8 search and rescue aircraft. The Minister of National Defence has assured this writer that aircraft purchased for search and rescue are for search and rescue only and that secondary military air mobility uses are not a priority. That being the case there is no reason that the lack of a rear loading ramp should be any impediment to the purchase of Canadian manufactured and modified Dash-8 search and rescue aircraft. 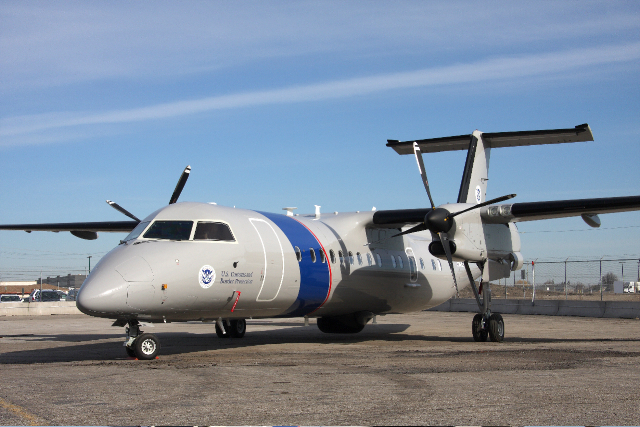 If the government wants to deal with the shortfall of search and rescue aircraft in an efficient and timely matter they can do so by immediately purchasing at least 12 Dash-8 aircraft with basic modifications for search and rescue. This would recapitalize the existing search and rescue fleet at an affordable price, take the pressure off the procurement system as it looks for the systems necessary to upgrade our search and rescue organization and show a willingness to acknowledge that sometimes good enough is good enough.